We went to a friend’s place for lunch today, and knowing of my interest in Belgian beer, Marie-Claire served us an ale produced in the part of the country where she is from. The beers of the Abbaye d'Aulne (ADA) are made by the Brasserie du Val de Sambre in the village of Gozée near the town of Thuin, south of Charleroi. I’ve asked around for these abbey beers here in Brussels at a couple of places with no luck. So I was very glad Marie-Claire’s mother brought some from Wallonia last time she visited her daughter, who coincidentally enough lives in Rue d’Aulne in Brussels. 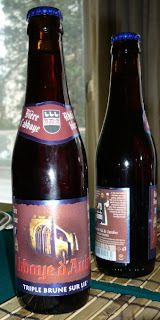 The Abbaye d'Aulne Triple brune 8° is a dark beer, about the colour of maple syrup. the aroma is light malt with charcoal and ash. The taste is a combination of coffee, chocolate and liquorice -- slightly sweet at first, but then the bitter hops kick in and balance it out nicely. It is not one of the super-thick darks, but it is richer than, say, Ciney brune. To me, it’s most like a Moinette Brune, so a superior dark beer in other words. Once again, then, I’ve found a very good Belgian beer that is relatively unknown even within this country, let alone abroad. Having said that, however, I notice now that in the book 52 brasseries coups de cœur en Belgique, it says that ten per cent of Brasserie du Val de Sambre’s production is exported. Just received word from Premium Beverage Imports Ltd, who inform me that they have decided bring this beer to American audiences. They are now the exclusive importer of ADA and will be marketing and promoting it throughout the US.